It has seemed very Spring like over the last few days with glorious sunshine a pleasant change from slate grey skies. The days are noticeably longer now and it is pleasant to be able to finish work and still get to the allotment in daylight. 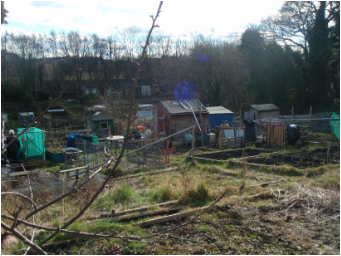 Easter falls on the 25th of March this year and the clocks go forward over the same week end which means an extra hour of daylight after work to be getting on with preparing the allotment for Spring planting. I started chitting my potatoes shortly after I bought them a few weeks ago and I’ve gone for two varieties which I haven’t tried before – Pentland Bard and Anja. I had ordered Pink Fir Apple and received Anja as a suitable substitute. I have been a fan of Pink Fir Apple since first digging them up on my newly acquired allotment site 4 years ago after finding them the most delicious boiled potatoes I had ever tasted . Apparently Anja is a cross between Pink Fir Apple and another well known variety. The traditional time to start planting potatoes is the day after St Patrick’s Day (17 March). Chitting potatoes – place the potato tubers upright in old egg cartons with the rose end uppermost – this is the end with a cluster of “eyes” at one end. This process is said to improve the weight of the crop by kick starting the growth of the seed potatoes. The trays should then be placed in a light frost free place with a temperature of around 16 degrees to encourage the eyes to sprout and develop into short green shoots that will produce the crop during the summer. Potatoes are organised into three groups; early, second early and maincrop which refers to the lifting times. maincrops take 16– 20+ weeks. Depending upon your local site conditions try and plant out all of the seed potatoes by the end of April to give them the longest possible growing season, sometimes this isn’t possible and it will be reflected in the size of your crop. Before the seed potatoes are planted rub off all but three of the chatted shoots. This is to allow the plant to produce a reasonable crop of usable potatoes. If all of the shoots are left on you will get lots of small potatoes. Earlies are planted 6ins/15cms deep in rows 12ins/30cms apart with 24ins/60cms between the rows. The most common method is the take out as trench that has one vertical side to support the seed potato before filling in the trench with the loose soil taking care not to disturb the seed potato. If the soil is in good condition the seed potatoes can be planted using a trowel. They will be ready for lifting from mid-June. Early potatoes will not store well and must be used as soon as possible. They are best lifted as required for the table. Second earlies are planted 6ins/15cms deep in rows 18ins/45cms apart with 30ins/ 75cms between the rows. Second earlies are ready for lifting from August they will be ready to use until the end of October. Once the haulm is about 9ins/20cms tall it is ready for the first earthing up. Draw the soil up along the row using a draw hoe leaving just a little of the top leaves visible out of the soil. Wait until the growth has developed by another 9ins/20cms and repeat the process if it is possible.The final ridge should be around 2ft/60cms high and should form a deep valley between the rows. Regularly watering the crop is important but this only needs to be done from the flowering stage onwards. Seed bed preparation - when the weather conditions allow it, complete the preparations of seed beds for direct seed sowing. Spread the job out over several days to allow the surface of the soil to dry out. Transplant any early peas, broad beans, cabbages or lettuce you may have started off earlier. Sow the seed of summer cabbage, broccoli, onions ,leeks and Brussels sprouts in short rows on a “nursery seed bed”. These can be grown on to be transplanted in April. Sow in rows in the open ground seeds of Swiss chard, early types of beetroot, carrots, parsnips, lettuce, Spring onions, peas, broad beans turnips and round seeded spinach. Plant out onion sets, shallots and garlic before they start to sprout as otherwise they may bolt later on.